We are here providing you the detailed information about the Kings XI Punjab and the other information relating to the true prediction of the Indian Premier League all matches but before you take the prediction tale a look on the various team and its formation and the players are in it. What is it's weakness and what are its strength so that it will be easy for you to predict about the result and you have a slight idea about who is going to win the match? We are also providing the various ways from where you can book your tickets online. Axar Patel: An all-rounder batsman of team India who is a left-handed batsman with the Slow left-arm orthodox bowling style. Yuvraj Singh: Another devastating player of Indian Cricket team. He holds the record for hitting the fastest fifty. he is a fighter as he fought from cancer. A left-handed batsman also serves as an all-rounder with the bowling action of a spin bowler. Karun Nair: A Right-handed batsman with not enough experience but abe to handle every situation under any circumstances. He has a bowling action of Right-arm off break. David Miller: An experienced left-handed player who holds the with the batting style of Left-handed and also have the bowling style as Right-arm off break. his main role in to play as the batsman of the middle order. Ankit Rajpoot: A Right-handed batsman with the Right-arm medium-fast bowling style serves as a fast bowler in the team. he is only given chance in IPL only. Mujeeb Ur Rahman: A right-handed batsman from Bangladesh with the bowling style of Right-arm off break. An experienced player of his team. Andrew Tye: An Australian cricketer Left-handed batsman but a right arm fast bowler. 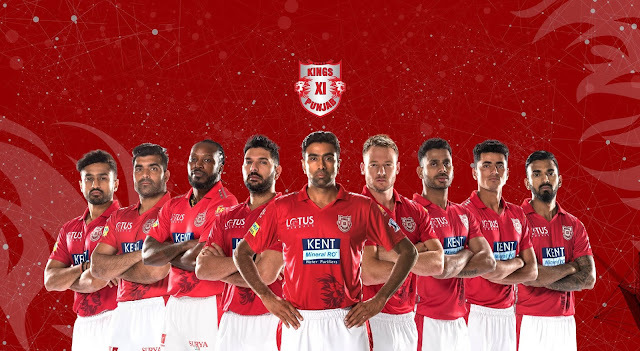 With the mentor-like Virendra Sehwag Jings XI Punjab is one of the excellent team of IPL and under the guidance of experienced player like Yuvraj Singh and Chris Gayle who are capable of playing at any soil it will be hard for other teams to give them an easy match. The home ground of this team is PCA Stadium, Mohali and the secondary ground is Holkar Stadium, Indore. The team color is "Red with Silver Strips".